His Excellency Lyonchhen Jigmi Y. Thinley, Hon’ble Prime Minister, The Royal Government of Bhutan receiving the KISS Humanitarian Award from Ms. Anne F. Stenhammer, Regional Programme Director, UN Women, South Asia Regional Office in the presence of Dr. A. Samanta, Founder, KIIT & KISS. 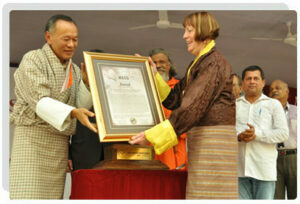 His Excellency Lyonchhen Jigmi Y. Thinley, Hon’ble Prime Minister, The Royal Government of Bhutan receiving the KISS Humanitarian Award from Ms. Anne F. Stenhammer, Regional Programme Director, UN Women, South Asia Regional Office in the presence of Dr. A. Samanta, Founder, KIIT & KISS and Mr. R. N. Dash, Secretary, KIIT & KISS. 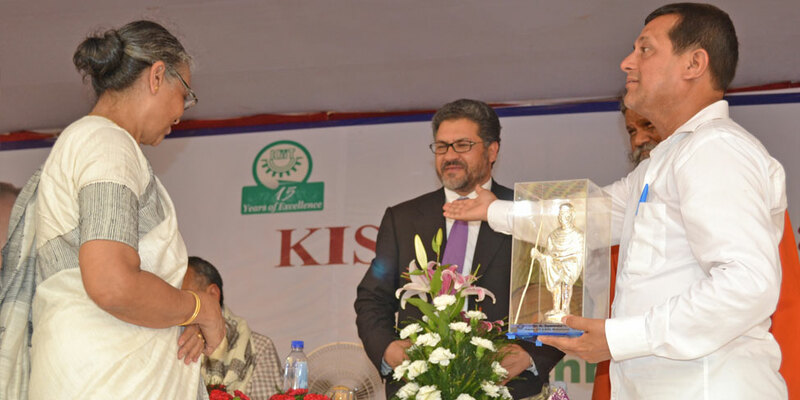 Mr. Farooq Wardak, Hon’ble Minister of Education, Islamic Republic of Afghanistan receiving a memento from Dr. A. Samanta, Founder, KIIT & KISS in the presence of Smt. Saswati Bal, President, KIIT-KISS Society. 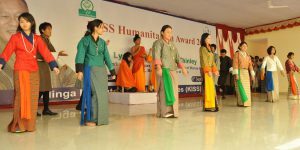 Bhutanese students of KIIT performing on the occasion. 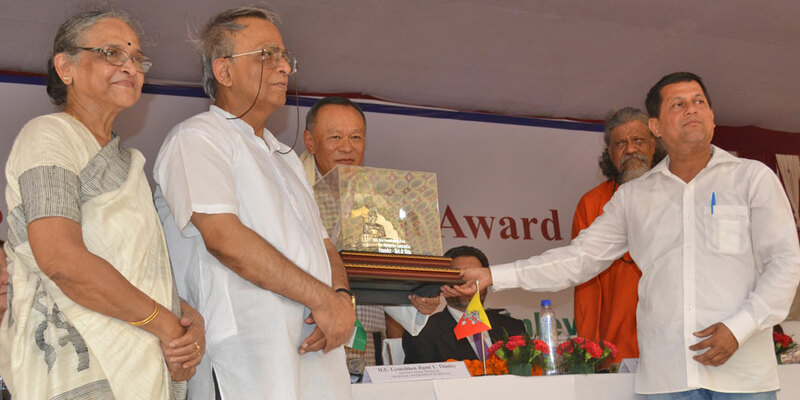 His Excellency Lyonchhen Jigmi Y. Thinley, Hon’ble Prime Minister, The Royal Government of Bhutan receiving a memento from Dr. A. Samanta, Founder, KIIT & KISS in the presence of Shri Prasanna Kumar Patasani, Hon’ble M.P., Bhubaneswar, Smt. 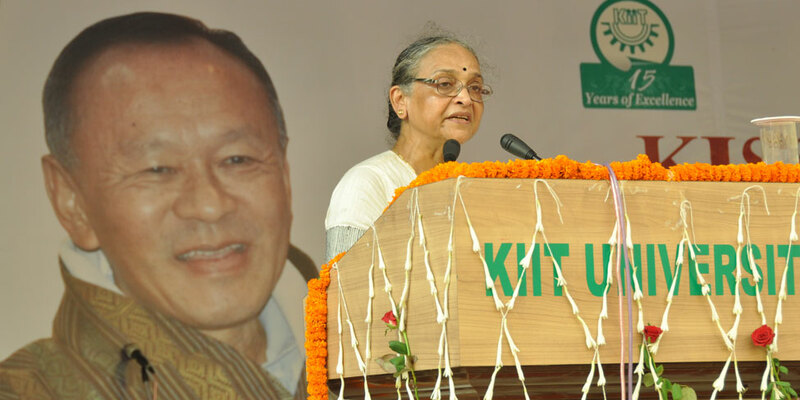 Saswati Bal, President, KIIT-KISS Society and Prof. N. L. Mitra, Chancellor, KIIT University. 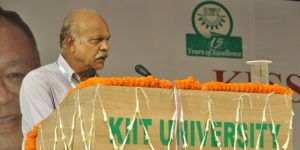 Mr. R. N. Dash, Secretary, KIIT & KISS speaking on the occasion. 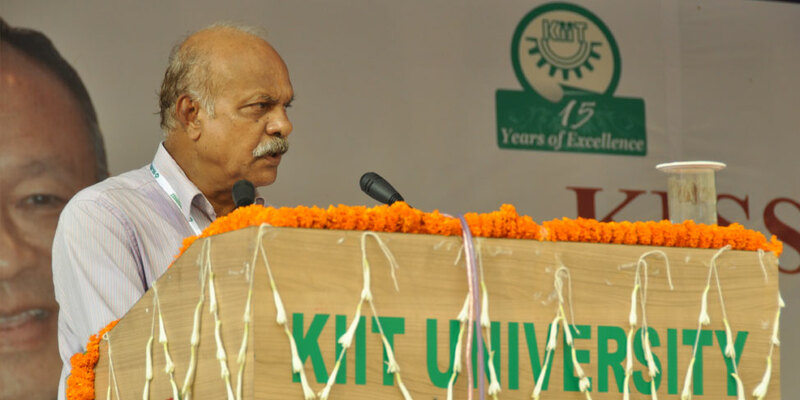 Prof. N. L. Mitra, Chancellor, KIIT University speaking on the occasion. Smt. 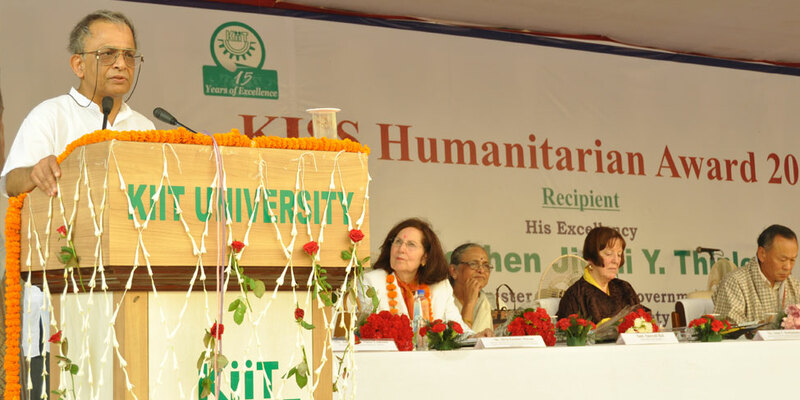 Saswati Bal, President, KIIT-KISS Society speaking on the occasion. His Excellency Lyonchhen Jigmi Y. Thinley, Hon’ble Prime Minister, The Royal Government of Bhutan speaking on the occasion. 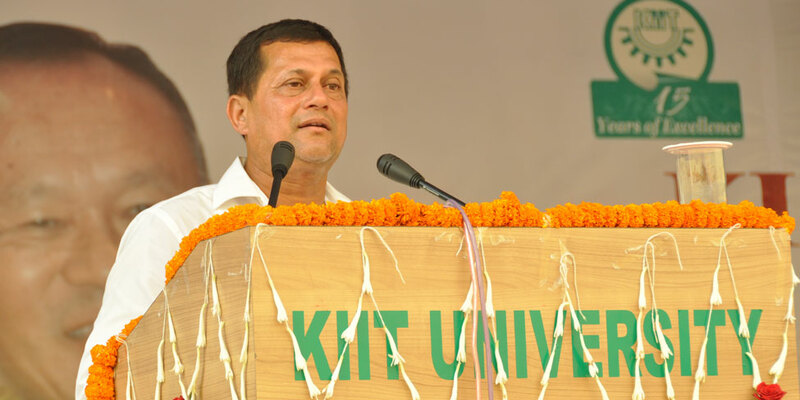 Dr. A. Samanta, Founder, KIIT & KISS speaking on the occasion. Mr. Farooq Wardak, Hon’ble Minister of Education, Islamic Republic of Afghanistan speaking on the occasion. 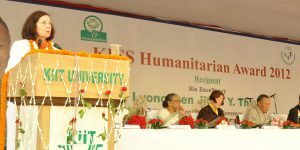 Ms. Anne F. Stenhammer, Regional Programme Director, UN Women, South Asia Regional Office speaking on the occasion. Ms. Silvia Escobar Moreno, Hon’ble Special Ambassador for Human Rights, Ministry of Foreign Affairs & Cooperation, Spain speaking on the occasion. Ms. Anne F. Stenhammer, Regional Programme Director, UN Women, South Asia Regional Office receiving a memento from Smt. 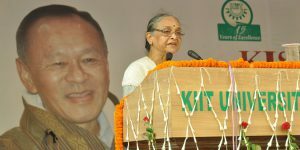 Saswati Bal, President, KIIT-KISS Society. His Excellency Lyonchhen Jigmi Y. Thinley, Hon’ble Prime Minister, The Royal Government of Bhutan receiving the KISS Humanitarian Award from Ms. Anne F. Stenhammer, Regional Programme Director, UN Women, South Asia Regional Office in the presence of Mr. Farooq Wardak, Hon’ble Minister of Education, Islamic Republic of Afghanistan, Shri Prasanna Kumar Patasani, Hon’ble M.P., Bhubaneswar and Dr. A. Samanta, Founder, KIIT & KISS. Students of KIIT performing on the occasion. 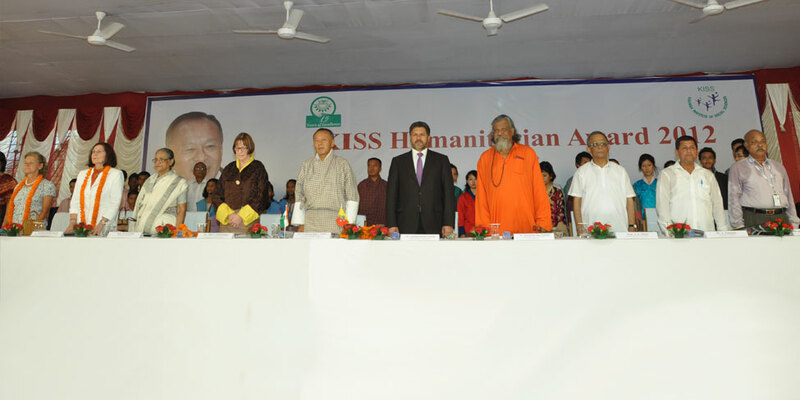 His Excellency Lyonchhen Jigmi Y. Thinley, Hon’ble Prime Minister, The Royal Government of Bhutan, Dr. Kee Sun Ham, Hon’ble President, Hanseo University, South Korea, Mr. Farooq Wardak, Hon’ble Minister of Education, Islamic Republic of Afghanistan & Dr. A. Samanta, Founder, KIIT & KISS with students of KIIT University. 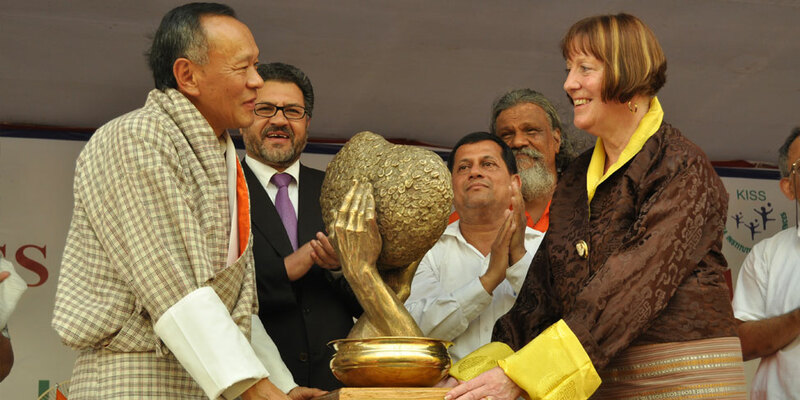 The KISS Humanitarian Award for 2012 was conferred on His Excellency Lyonchhen Jigmi Y. Thinley, Hon’ble Prime Minister, The Royal Government of Bhutan on 8th September 2012 in acknowledgement of his “vision for a beautiful world and concern for the humanity at large”. 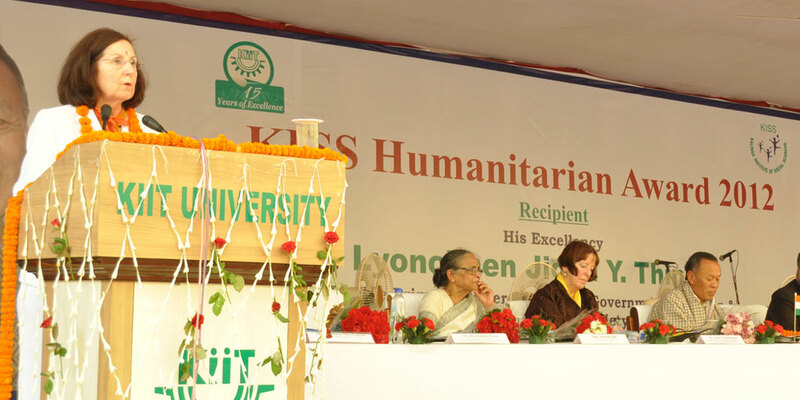 Ms. Anne F. Stenhammer, Regional Programme Director, UN Women, South Asia Regional Office presented the award to Mr. Thinley at a glittering ceremony held at Kalinga Institute of Social Sciences (KISS), Bhubaneswar. 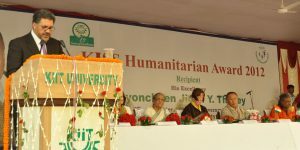 The KISS Humanitarian Award was instituted by Dr. Achyuta Samanta, noted social activist and Founder of KISS, the largest free residential tribal institute of the world, in 2008 to honour and recognize individuals with exceptionally high contribution to the society in various fields relating to social issues and who have distinguished themselves as true humanitarians. Awardees, whose works should be in harmony with the principles of KISS, are chosen by a high-level jury. “Concerned by the widening gap between the rich and poor and the way in which humanity is being impelled toward self destruction by insatiable greed, depleting natural resources and rising conflicts, you have moved the world to consider alternative development models. To this end, you have offered Gross National Happiness (GNH) as a holistic, sustainable and inclusive development paradigm”, said the citation. 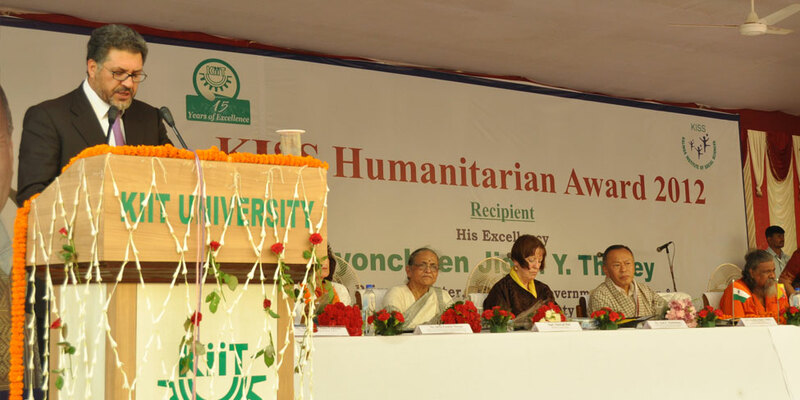 The award ceremony was graced by Mr. Ghulam Farooq Wardak, Hon’ble Minister of Education, Islamic Republic of Afghanistan, Dr. P. K. Patasani, Hon’ble MP, Bhubaneswar and Ms. Silvia Escobar Moreno, Hon’ble Special Ambassador for Human Rights, Ministry of Foreign Affairs & Cooperation, Spain. 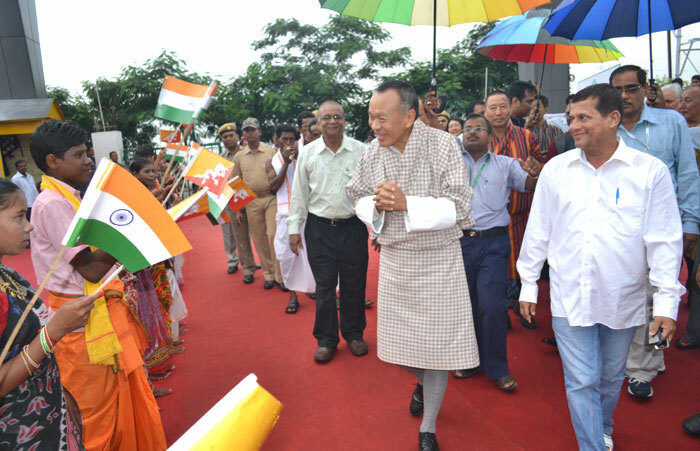 In his reciprocation speech, Mr. Thinley said that the honour will encourage and inspire him to continue his work for world peace and sustainable development. There so many children in the world who do not have opportunity for education and to pursue their dreams, he said, adding that individuals like Dr. Samanta provide hope in their lives. 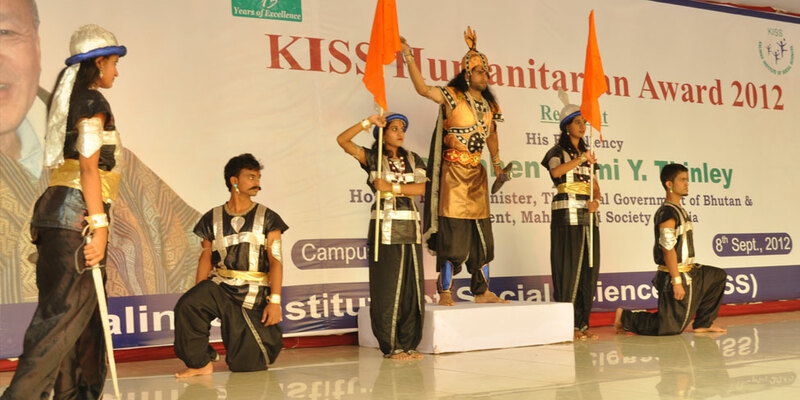 “KISS is realizing humanitarian dream of quality education for marginalized children. 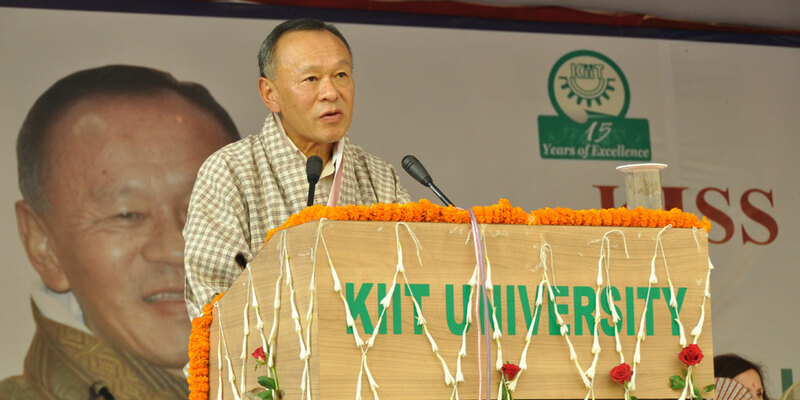 It has already achieved what Bhutan is still struggling to achieve”, the Prime Minister of Bhutan stated, while calling Dr. Samanta “one of the greatest humanitarian in the world today”. Congratulating Mr. Thinley for the award, Mr. Ghulam Farooq Wardak recounted his contribution for the world peace. 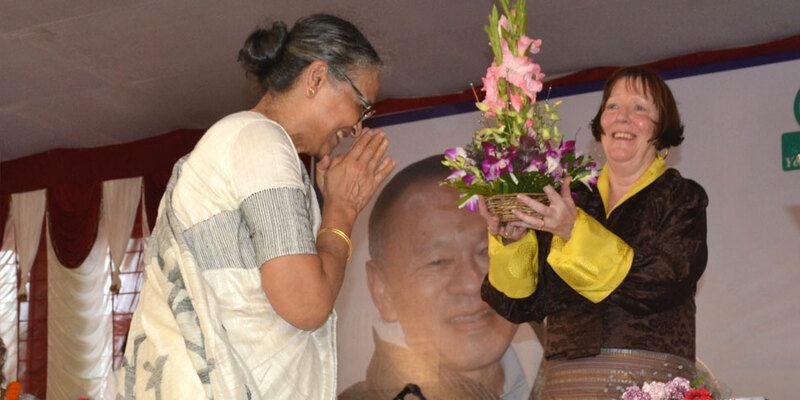 Ms. Anne F. Stenhammer commended Dr. Samanta for taking quality education to the margins of Indian society. Education has power to change a society and the world, said Ms. Silvia Escobar Moreno, while expressing happiness that girls constitute about 50% of students’ strength of KISS. Dr. Patasani extended welcome to the Prime Minister of Bhutan, Education Minister of Afghanistan and other dignitaries to Odisha on behalf of the Chief Minister of Odisha and people of the state. It is a honour for KISS to present this award to a personality like Mr. Thinley, said Dr. Samanta, while welcoming the dignitaries to KISS. Smt. 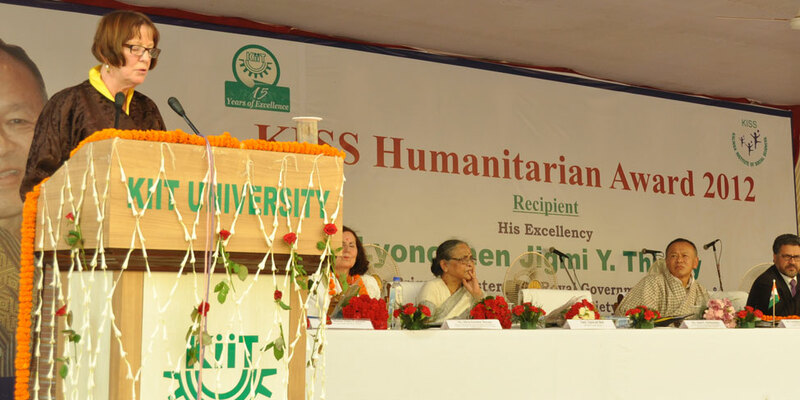 Saswati Bal, President, KISS delivered the presidential address. 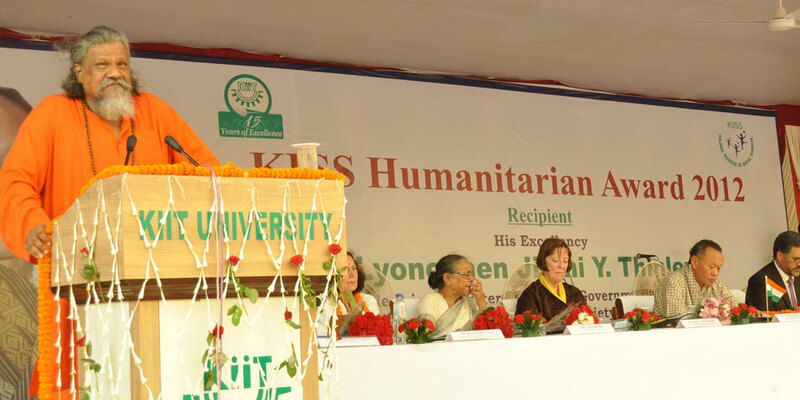 Kalinga War awakened humanitarian spirit in Emperor Ashoka and subsequently humanitarian missions were sent to countries far and wide from this land, said Prof. N. L. Mitra, Chancellor, KIIT University. 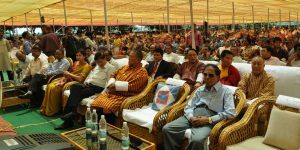 Mr. Thinley, who heads the first democratically elected Government of Bhutan, has won world appreciation for proposing GNH as an alternative development parameter and advocating its inclusion as the ninth Millennium Development Goals. 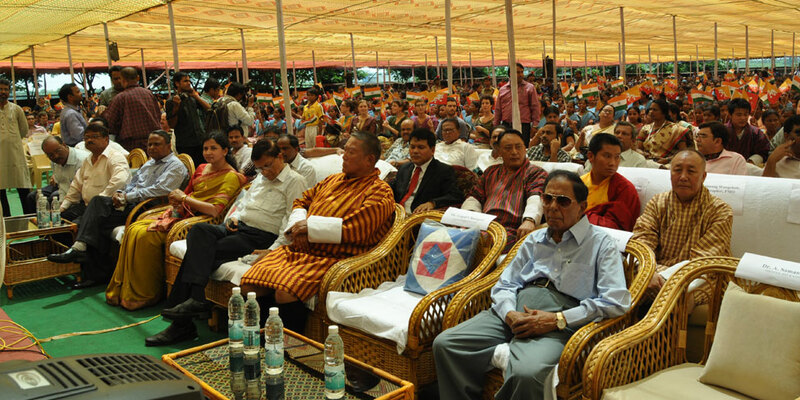 Before the introduction of democracy in Bhutan in 2008, he served the previous government in various capacities, including as Minister for Foreign Affairs and Minister for Home and Cultural Affairs. He also served as Prime Minister from 1998 to 1999 and again from 2003 to 2004, when cabinet ministers held the post on an annual rotational basis. 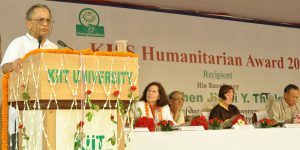 KISS Humanitarian Award is being presented every year since its inception to great compassionate leaders of vision and concern for human values from different parts of the world. Previous recipients of the award are Rt. Hon Lord Nicholas Addison Phillips, President of the Supreme Court of The United Kingdom (2011), His Excellency Rt. Hon. Sir Anerood Jugnauth, (then) President, Republic of Mauritius (2010), Dr. Ham Kee-Sun, Hon’ble President & Founder, Hanseo University, South Korea (2009) and Madam Bomo Edna Molewa, (then) Premier, North West Province, Republic of South Africa (2008). Mr. R. N. Dash, Secretary, KISS proposed the vote of thanks. Jigmi Y. Thinley became Prime Minister (Lyonchhen) of Bhutan after leading his party, the Bhutan Peace and Prosperity Party or Druk Phuensum Tshogpa, to victory in Bhutan’s first ever national election in March 2008. He represents Nanong Shumar constituency in Pemagatsel, Eastern Bhutan. Before the introduction of democracy in Bhutan, he served the previous government in various capacities, including as Minister for Foreign Affairs and Minister for Home and Cultural Affairs. He also served as Prime Minister from 1998 to 1999 and again from 2003 to 2004, when cabinet ministers held the post on an annual rotational basis. Born in Bumthang, Bhutan in 1952, Thinley graduated with honors from St. Stephen’s College of Delhi University and went on to obtain a master’s degree in Public Administration from Pennsylvania State University in 1976. He joined Bhutan Civil Service in 1974. 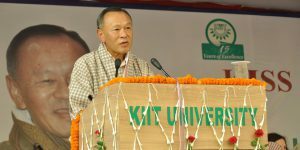 Currently he also serves as Chairman of his country’s Tourism Council, Dzongkha Development Commission, Gross National Happiness Commission, National Environment Commission, Royal Education Council, Ugyen Wangchuck Institute of Conservation and Environment; and Patron of National Solid Waste Management Programme. Thinley has published many essays and papers on a wide range of topics and spoken at several conferences, meetings and seminars. He has addressed the United Nations General Assembly numerous times, spoken at regional summits and other international meetings such as the SAARC, the BIMSTEC and the Non-Aligned Movement as Prime Minister and Foreign Minister of Bhutan. He is an International Counselor for the Asia Society, New York; Member of the International Advisory Board of the Netherlands Development Organization; and Chairman of Steering Committee for the International Expert Working Group for the new paradigm to promote well-being and happiness of all life on earth. As a concerned leader Jigmi Y. Thinley has always advocated for Gross National Happiness (GNH) in measuring progress of any nation, instead of depending on growth in terms of Gross Domestic Product (GDP). He has always looked for happiness for every individual and continues to emphasise on the need for a holistic approach to development. He advocates for equitable and sustainable socio-economic development, judicious use of natural resources, conservation of environment, motivation for developing human relations and good governance. For the happiness of individual, he speaks about health and physical well being, educational attainment, environment resilience, cultural diversity, community vitality, emotional and psychological well being, etc. A person with such sensibility and sensitivity could not have remained without being rewarded, for which he has received many awards and accolades like Dasho, Red Scarf, Orange Scarf titles, Druk Thuksey and Coronation medals. 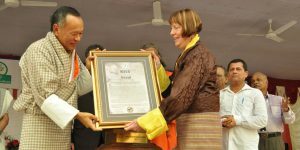 In 2009, His Majesty the Fifth King of Bhutan awarded Thinley the Druk Wangyel Medal – the highest civilian decoration – for excellence in carrying out his duties. That same year, Penn State presented him with the Distinguished Alumni Award, the highest honor the university confers on an outstanding alumnus. 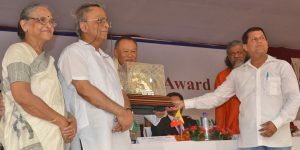 In February of this year, Thinley received the HR Strategic and Iconic Leader Award at the World HRD Congress 2010 in Mumbai, an international initiative dedicated to shaping the future of organizations through talent management and development. It is for his towering personality and for his vision, the KISS Humanitarian Award for 2012 goes to him. 07.09.2012 : His Excellency Lyonchhen Jigmi Y. Thinley, Hon’ble Prime Minister, The Royal Government of Bhutan addressing the students of KISS. 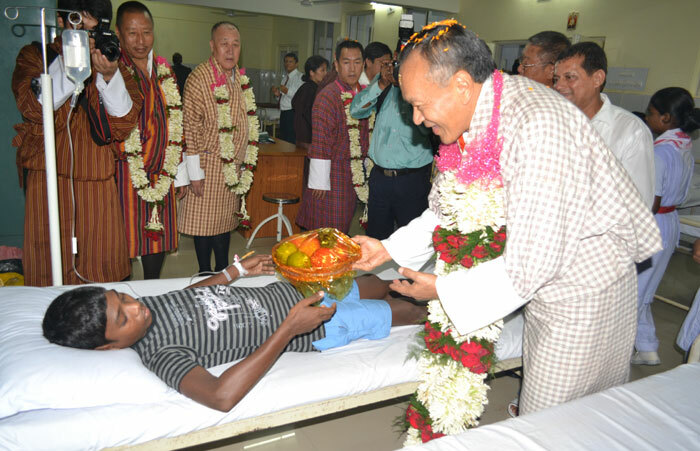 07.09.2012 :His Excellency Lyonchhen Jigmi Y. Thinley, Hon’ble Prime Minister, The Royal Government of Bhutan distributing fruits among patients at KISS dispensary. 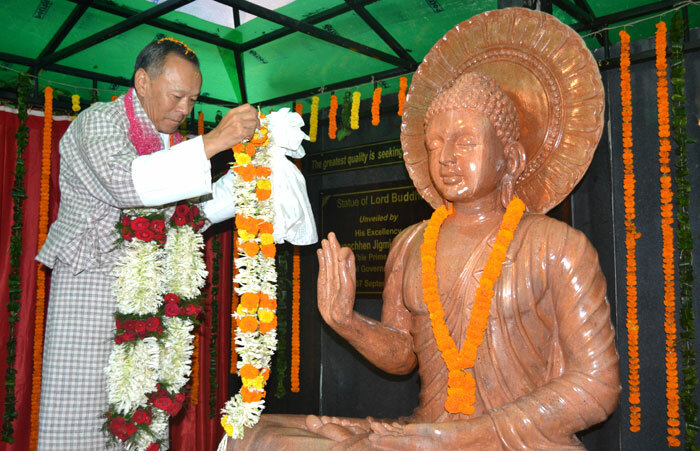 07.09.2012 : His Excellency Lyonchhen Jigmi Y. Thinley, Hon’ble Prime Minister, The Royal Government of Bhutan garlanding a statue of Lord Buddha in KISS campus. 07.09.2012 : His Excellency Lyonchhen Jigmi Y. Thinley, Hon’ble Prime Minister, The Royal Government of Bhutan unveiling a golden plaque in his honour at KISS in the presence of Mr. Dorji Wangdi, Hon’ble Minister of Labour and Human Resources, The Royal Government of Bhutan, Dr. A. Samanta, Founder, KIIT & KISS and other distinguished dignitaries from Bhutan. 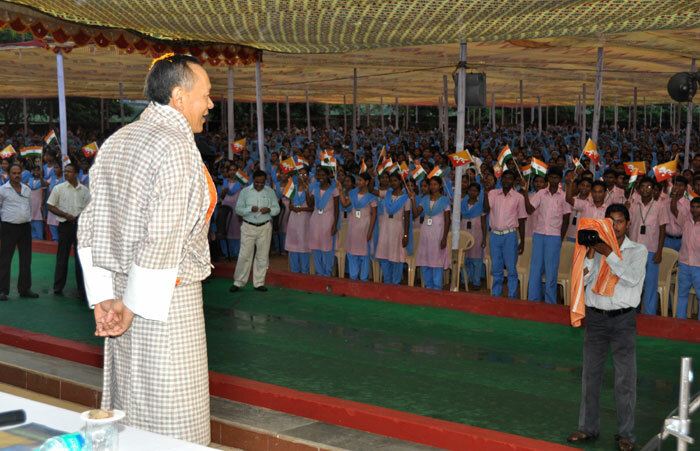 07.09.2012 : His Excellency Lyonchhen Jigmi Y. Thinley, Hon’ble Prime Minister, The Royal Government of Bhutan and other distinguished dignitaries from Bhutan receiving a warm welcome in KISS. 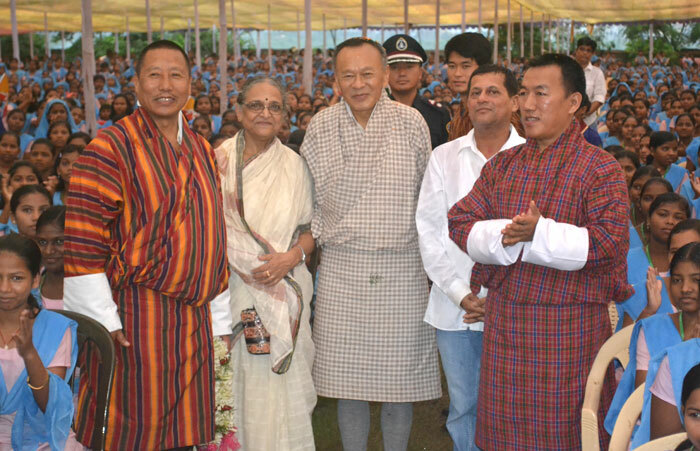 07.09.2012 : His Excellency Lyonchhen Jigmi Y. Thinley, Hon’ble Prime Minister, The Royal Government of Bhutan flanked by Mr. Dorji Wangdi, Hon’ble Minister of Labour and Human Resources, The Royal Government of Bhutan, Smt. 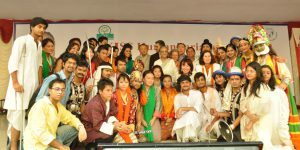 Saswati Bal, President, KIIT & KISS, Dr. A. Samanta, Founder, KIIT & KISS, other distinguished dignitaries from Bhutan & students of KISS.